Screw the werewolves we saw a few days ago….Edward in black. Yes please. I have to agree — that’s a striking poster of Edward Cullen. Yes, indeed, a naked chest will sell + the paleness and gothic arches in the background are very appealing. Haha! Screw the werewolves…Edward in black!! I should probably read this book before the movie comes out :). 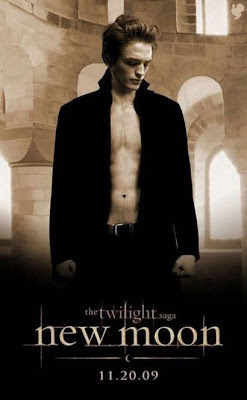 Amy – New Moon was not one of my favs..just because Edward didn’t get a lot of page time (Yes, I am a bit obsessed with him:) But still looking forward to the movie!! Oh my gosh!!! I will just SOOO have to put that on my site!!!! **fireworks are popping out my keyboard from ALLL the drool that is falling** **in need of CPR from Edward** **oh my, what does my imagination see in front of me!!!! *** I will have sweet dreams tonight! Thanks Mandi for sharing!!!! Cecile – LOL!! I am so glad I am not the only one with that reaction!! I saw it on Ms. Moonlight’s site and immediately told her I was stealing it for my blog:) How delicious is he?!?! All of you are crazy ..
And the leader of the this crazy gang is Mandi… I tell you the closer we get to the release of this movie.. I will have to reign you all in…. Mandi you keep on loving on Edward …. I know Cecile is hooked already..
“Yes, I am a Mom. My daughter bought it for me for Christmas!! !